Among the myriad varieties of dosas, a special mention must be made of Attukula dosa which also goes by the name of ‘Sponge Dosa’ because of its soft and spongy character. Friends who have tasted this dosa for the first time at our home have asked for the recipe. Sponge dosas are light and soft in the center with a slight crisp along the edges, simple yet delicious. Rice, rice flakes (poha/attukulu) and fenugreek seeds are soaked in sour buttermilk overnight and ground to a smooth paste, the next morning. 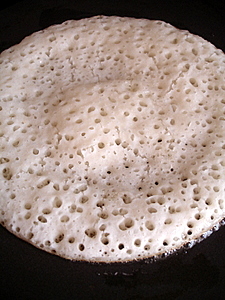 Unlike the masala dosa, here the dosa batter is not made into a large concentric circle on the tava. 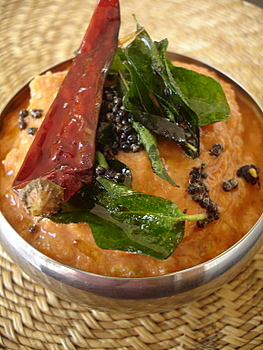 Ladleful of batter is poured on a hot tava to spread on its own, covered with lid and cooked to a soft and spongy texture. Soak rice, poha, methi seeds in thick buttermilk overnight (8-10 hrs). Next morning, grind to a smooth paste. The batter should be of pouring consistency. Add salt and cooking soda and combine well. Leave aside for 2 hours. Pre-heat an iron tawa on high for half a minute. Do the water test (sprinkle few drops of water over the hot tawa such that it sizzles) and reduce heat. Pour a large ladle full of dosa batter in the center of the tawa and gently with the back of the ladle make a very slight circular motion (as shown in the picture below) or just let the batter spread on its own naturally. Pour a half a tsp of oil like drops along the edge of the dosa. Cover with a lid and on medium heat let the dosa cook for a minute till the rawness disappears and the dosa browns. Flip the dosa and let it cook for a less than half a minute (need not cover with lid). Flipping the dosa and cooking on the other side is optional. Heat three tsps oil in a pan, add a tsp of cumin seeds and 3 green chillis and saute for a minute. Add 2 large sliced tomatoes and saute till they turn soft. Turn off heat and cool. Grind the sauteed tomatoes along with salt to a smooth paste (no water). For tempering, heat half a tsp of oil in a pan, add a half a tsp of mustard seeds and let them splutter. Add a dry red chilli, few curry leaves and pinch of asafoetida and turn off heat. Pour this seasoning over the chutney and serve with sponge dosas. thanks for the recipe…we call this challa(buttermilk) pongaralu(another name for atlu),although much smaller in size,which is made in a deep karahi rather than a tawa…thanks once again for the proportions…do we need to add more atukulu for crispier atlu? These are meant to be soft and fluffy. Usually poha gives a crisper dosa including a nice brown shade. The proportions I have given for attukulu are fine, though you could increase by another 1/4th cup. Wonderful idea! Dosa and chutney look perfect. I’ve been looking for recipes that use aval. Thanks. Looks too good. Chutney looks perfect. We make similar dosas minus the soda and buttermilk. I ferment the batter overnight. 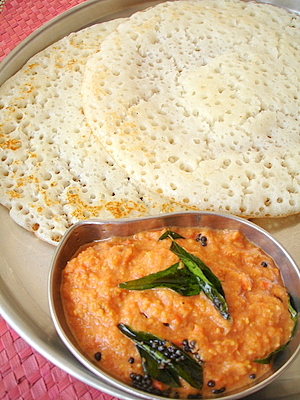 Lovely dosas, Sailu! So soft and porous. Looks great. And the tomato chutney! What a great combo! Looks too good. We make similar dosas minus the buttermilk and soda. 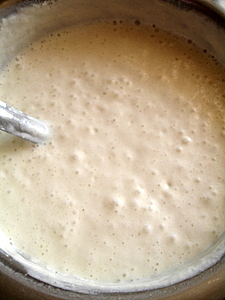 I ferment the batter overnight. I am regular visitor to ur site. I can say am a big fan of ur recipes. We call these dosas ‘bread dosa’ may be because of the texture and the taste that resembles regular bread. I had them couple of times at my aunt’s place but never knew the recipe. Thanks for the recipe. Will try it. My ammamma used to add 3 to 4 spoons of urad daal along with rice as it makes the dosas very soft . It really makes a difference as I started adding it since my last two attempts and it worked out well. And do you know the tomato chutney in which methi seeds are also added and tomatoes are not actually grinded ? Yes, I’m aware of tomato chutney with methi seeds, Anu. 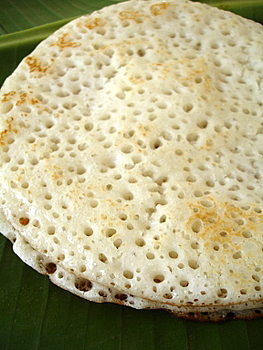 I’ve bookmarked the dosa – sounds and looks amazing! thanks for sharing! Sailu, Can we use par-boiled rice here? No, Suganya. You can use any variety of raw rice. We make the same dosa with smae proportions as yours,but we put sauted oninons and green chillies and also grated carrots.we add these both just before making dosas. This is going to be tried over the weekend. Yes, TBC, its raw rice. Those dosas look really very soft & spongy. Loved the chutney too. Gorgeous pictures! Dose and chutney looks yumm. Will try this, new recipe to me. Sailu, thks for sharing aval dosa and chutney recipe. Would try it out and return a fb. Wonderful recipe. Great Photos. I am going to try it surely. One doubt: Do you make this buttermilk from homemade curds? and could you also explain sour? Thank you somuch .. Yes, buttermilk is from homemade curd, Reena. Ferment in a stainless steel container and add a little more curd than usual to the warm milk, you will have slightly sour curds. Set aside curd (not in the refrigerator) and it will turn sour in a few hours. You have a great website, lovely pictures. We call this majjigattu in konaseema.. My ammamma is an expert in this dosa.. Looks very nice. Can you please post the recipe for tomato chutney with methi seeds as whenever I tried its kind of flop. Sailu, this is my fav dosa.. we call it majjige (buttermilk) dosa. i dont add soda to it..add lil bit of jaggery for that nice twist. Please tell me how to make the buttermilk. These dosas appear heavenly and I want to try them. But I wish to know how to make the buttermilk before trying. We simply beat curds with plenty of water and call it buttermilk. Is it the same way? That’s right. Just make a thick buttermilk with less water. I just saw this recipe and was too tempted by the photos, so i tried it today itself.. unfortunately.. i did not get such a spongy dosa with lots of holes.. it was tasting good tho’.. Esp the chutney was so simple and yummy. I am not sure if the problem is with butter milk or quantity of poha. I followed the same procedure. We really dont have sour curd. I added water to the usual tin of curd that we get and soaked it. Give me some alternatives to make curd sour. I really cant make home made curd here..i fail miserably in that. Pls suggest. But over all yummy. Planning to try this again after ur suggestions. I hope you soaked the rice for a couple of hours, atleast 8 hours. After grinding of batter, it needs to sit for a few hours, atleast 2 hours. Regarding curd, I can only suggest, try keeping the tinned curd (opened) at room temperature for a few hours and maybe add juice of a lemon to sour it. In India, we have no problem is preparing sour curd. Sailu wonderful recipe again! Quick question – is cooking soda same as baking soda? And is it mandatory? Also can the batter be made in a regular blender or do you need a wet grinder? Yes, Purnima, cooking soda is the same as baking soda and is necessary for this recipe. Well, since its rice we are grinding, a wet grinder works best. can you tell me how to prepare sour buttermilk.we live in us and i buy the yogurt from stores….it doesnt turn sour very easily..any tips..
Ha hA! we just made this last weekend! Took some pics too. will share over the weekend. Thanks to your blog, I enjoy great dinner! I’ve been an ardent fan of your blog, regularly following your interesting recipes and enjoying the pictures as much as the recipes. I felt you deserved a cute award. Check my blog: http://chefnme.blogspot.com. This looks great! thanks for sharing. Can I use baking powder instead of soda? Hi Sailaja, I am excited about this dosa…somehow it has never turned out as good looking as yours. They look so spongy and fluffy that I can almost feel them tangibly. Incredible. My breakfast tomorrow morning. Recipe looks like a sure success. Love your site. Its quite well done. This is a great way to teach people how to cook indian food. yes, indeed simple but exotic reciepe. but does not it look like uttapam? You can do it without soda also though I have never tried without cooking soda. your website has helped me realise my love for cooking..
Hi madam,i’ve tried this dosa and came very well…this is a regular recipe now at our house..thanks for this wonderful recipe..
visiting ur site after for a long time. planning to make poha dosa.one doubt regarding the measurements. r u using the regular measuring cups which is 1 cup is 8oz the one we use in usa. You can use US measuring cup, Diyaa. hey above u have mentioned rice….i didnt understand whether is it cooked (or) uncooked rice???? Nice recipe.Am going to try it today.Just wanted to ask.Till how many days the batter can be good to use? If refrigerated, 5-7 days is fine. Beyond that, the batter will turn very sour. Today I saw your website for a recipe of your’s through Eenadu news paper. I was surprised by seeing my favorite item, dosa. Often I make Dosa but not like this. First time I found a nice recipe. I am going to try it today. But every day I am unable to surf the Internet. So can you please arrange a cook book for each and every item in this website. this dosa is gr8. fine to c ur pics. how to get them more crisy? I tired ur poha dosa and tomato chutney it came out excellent. We just tried the tamato chutney,its too good and was very tasty. i tried this recipe. it was really soft n yummy but dosa was little sour to taste n became little watery. but thanks a ton for this wonderful recipe. Hi Sailu… will try this in a couple of days. Can you tell me whick rice did u use.. d boiled variety of the raw rice (basmati). I love ur site… have tried a few of the recipes n my family loved them. Luv all your recipes especially the attractive presentation and excellent photos…tried many of them… all of them turn out to be gud….. Please do respond… m really confused.. Thanks for the positive feedback and kind words, Shubha. Happy to learn you are enjoying Andhra food. You can use any kind of poha. Very good recipe Sailu, loved the pacchadi with poha dosa, as you said it is an excellent combo. Thanks a lot and give us more great recipes. Hi Sailu, I’m planning to try out your recipe and have never made dosas before! What type of rice did you use? Was it white basmati rice? I’m thinking of trying it with brown basmati rice but I’m not sure if that would affect the taste much? I used regular ‘sunnalu’ rice. You can use ‘sona masuri’ also. I have not tried with brown basmati rice. It might differ in taste. Just one last question, does the rice/poha/buttermilk mixture need to be left to soak in the fridge? Or is it safe to leave it out overnight? For how many days can we keep the tomato chutney? Thanks a lot for your recipes they are awesome. Your welcom. You store in the fridge for 2-3 days. hi sailu, ur recipes r very nice. i tried ur poha dosa and got very tasty poha dosa. thanks for ur recipes. i want green dal recipe. can u pls post it? how many days can we store this batter in fridge? 2-3 days, after that it will turn very sour. You have to use buttermilk or yogurt. Do try it and you will love the flavor. I too have trouble getting sour curd or buttermilk where i live. If after soaking in normal buttermilk the batter is not sour enough can i leave it to ferment a bit (like regular dosa batter)? i suppose we get good dosas with holes only if the batter is sour enough. thanks very much for the prompt reply, Sailu. I ground for set dosa the day i asked you this query. will soak for this next:) set dosa is a family favourite now. it gives such spongy dosas. thank you so much. can u pls post measurments for crispy plain dosa just like in restuarants.. Thanks for wonderful recipe. Worked out well. Though I would like to point out one thing that the first time dosa didn’t come out well. My mistake, buttermilk was not sour enough, I was concerned that it might get way too much sour so I kept soaked mixture in fridge overnight and made paste in the morning with plan to keep aside for 2 hours. During morning rush forgot about this and made dosa, all the while wondering why it was not spongy. It was tasty anyway so thought of trying next time and kept rest of the batter in fridge in 2-3 hours. In the evening when i made dosas it came out exactly like in your pictures. Wrote about this hoping this might help others who have posted comments here. Thanks a lot for a simple tasty recipe. I’ve tried many versions of this amazing dosa but but could never get the real taste..At last i found your recipe and looking at the picture itself i felt this is the right one. till now i made it three times and got the perfect result..thanks a ton..
Do you by any chance have the recipe of the chutney they serve with Guntur Idli in Chutneys Restaurant?The one with the pappu stuff? Does the batter have to ferment,in the sense does it have to double in volume or does it just have to sit around. I live in philadelphia and the first time I made it,it was perfect. The next two times tho,not so great. I let the batter sit but it didnt rise. Does it have to? It will rise but not too much like normal masala dosa batter will. Hi Sailu…the recipe looks yum!! Can I use rice flour instead of raw rice? Also, if I am using rice flour, how many cups should I use? Thanks! I would suggest going with raw rice. Your recipe worked out the best for me. Thanks a tonnn!!! just a quick question. as i mentioned in my earlier post, the dosas came out wonderful. but after i kept the batter in the fridge and tried making the dosa the next day evening, they kinda came out flat and not spongy. do i need to add a tad bit of soda everytime i take the batter out of the fridge? because the initial two times, i did just that and it came out great. but the last time i dint add any more soda, and it came out flat. so is that the mistake i did? please enlighten me. I’ve tried this recipe down to it’s measurements and all, but recently my dosas turn yellowish and smell of soda. May I know what I’m doing wrong? And how should I improve? Reduce methi seeds to 1/2 tsp. Add a pinch of cooking soda just before making the dosas. You need to wash the urad dal very very well. Before soaking the dal, you need to wash the dal. After soaking the dal and before grinding, you need to wash the dal. Also while soaking the urad dal in water, do not place lid. How much Urad dal do we need to soak? Didn’t mention it in the recipe. Neela, my comment regarding urad dal was for the regular dosa making query. For Attukula dosa, you do not need urad dal. Thanks for the wonderful recipe. This is a hit recipe at my home and office. Well you could use Plain Yogurt any of the brands at the grocery store. It adds flavor. Of course do not buy flavored just plain. For this quantity in the recipe makes how many dosas?